If you run a company, you can tell your employees they must attend your meeting. If you run an association, you can tell your members they should attend your meeting. But either way, if they’re not having fun somebody is doing it wrong. And isn’t it a lot better for everyone if people want to attend your meeting? And what better way to motivate the audience than through humor? Laughter is the best medicine, but too many organizations leave this critical component out of meetings and conferences. Vinny is here to make sure things not only go right, but that people have a good time! Disclaimer: If you’re looking for a content speaker with a single compelling message, a speaker to change lives, Vinny is not for you. 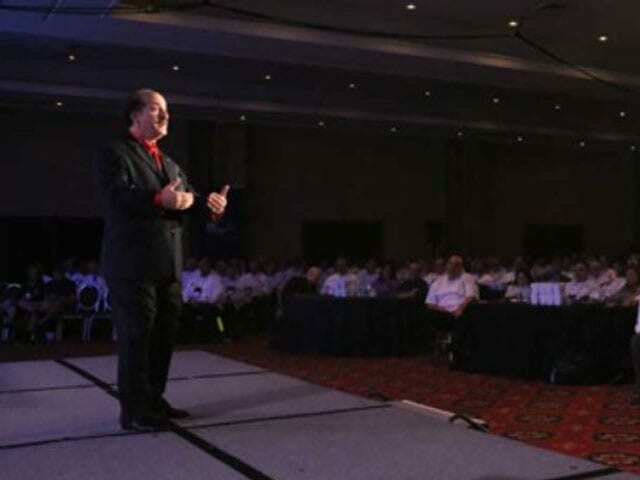 Vinny tailors each speech to your specific audience, and is not a one-size-fits-all speaker. Are you tired of fill-in-the-blank conference presentations? Vinny doesn’t have a list of topics or program titles, because at your event the topic is all about you, your company, and your attendees. Vinny’s signature teaching, the Bada Bing Philosophy, is his unique approach to Negativity Management. One maxim, Two steps, and Three simple tools equals one outstanding keynote! At a time when your audience needs a lift (first thing in the morning, after lunch, after a presentation on compliance) send in Vinny to boost the energy. If your audience feels like they’re wearing concrete shoes, Vinny will come in to increase the energy and get the audience engaged again. Vinny knows how to do the heavy lifting while keeping it light. As your strategic emcee and a pretty funny speaker, Vinny will open your meeting with his wacky motivational wisdom and customized insight into your specific agenda. From there he’ll introduce the general session speakers throughout the day, and then provide hilarious summaries of their content. This serves to reinforce key points, enhances continuity, and keeps your program on time. • A breakout gets moved or cancelled? Send Vinny in with the announcement and a laugh. • A “celebrity” speaker or industry expert runs short? Send Vinny in to fill time and get the audience laughing and focused on what’s happening next. • Got a raffle or fundraiser? Send Vinny in to keep things moving, sell more tickets, get more donations – and everyone is a winner. 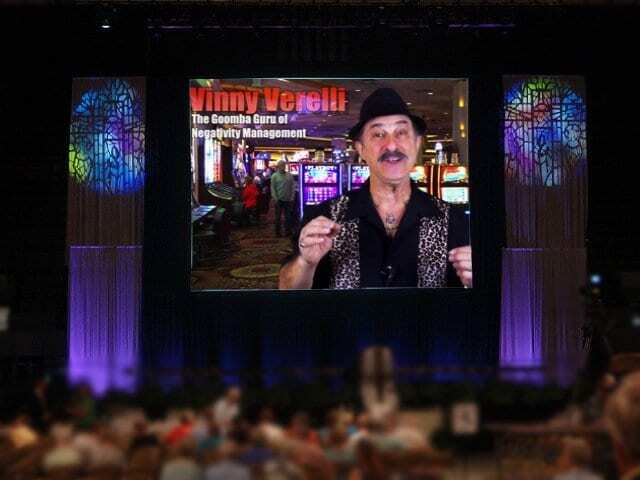 Whether Vinny does a keynote or stays to emcee, he will produce a video to promote your event which will help ignite interest and the desire to attend. He’ll also produce a series of funny clips that you can mail, post, or tweet giving attendees up to date information and breaking news. What if you want nothing more than to have Vinny be a part of your event, but the budget is tight? You can save a lot just by having Vinny appear virtually. In addition to the promo videos, you can have Vinny on video at the event itself. He’ll provide pre-recorded video segments that ask just the right questions to get clarification on something that was said, reinforcing the concept or a question to help a speaker segue into the next part of the agenda. Virtual and promotional videos can be delivered ready to go, where we provide a link to the finished video and you decide how to share. We can also record your video in front of a green screen allowing your production team to place Vinny where ever you’d like. If putting Vinny up in a hotel isn’t in the cards right now, Virtual Vinny could be right for you. Vinny is an amazing emcee. For 3 days he guided our speakers' convention with imagination, grace and firmness. He captured our hearts and attention from his opening monologue to his closing remarks. Vinny does his homework, understands conventions and most importantly, he's really funny. 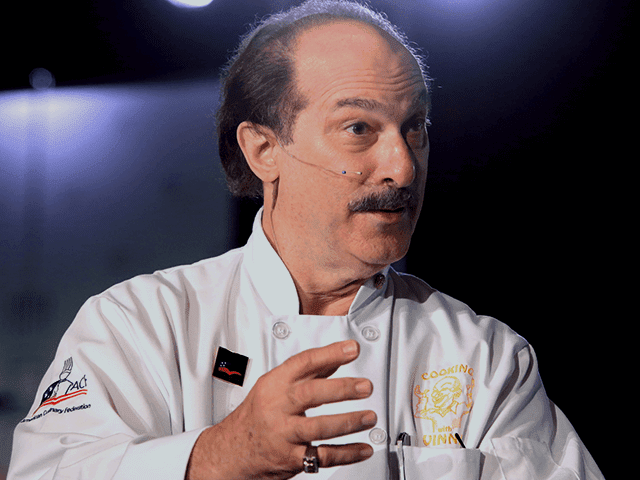 Vinny has a truly unique approach to keeping attendees engaged through humor and the ‘Bada Bing’ philosophy, … his real world culinary and foodservice experience added another layer and gave Vinny credibility with our membership. Jon’s performance at our annual conference as Vinny Verelli was second to none. He was an event planners dream to work with as he was very accommodating when the schedule shifted or he had to do some quick thinking on his feet. I would recommend Jon as a speaker to anyone looking for a professional and entertaining MC. Not every speaker is for every audience. Make your next event more fun, engaging and memorable. Vinny’s ideal audience is an older, educated crowd with at least 50% women.